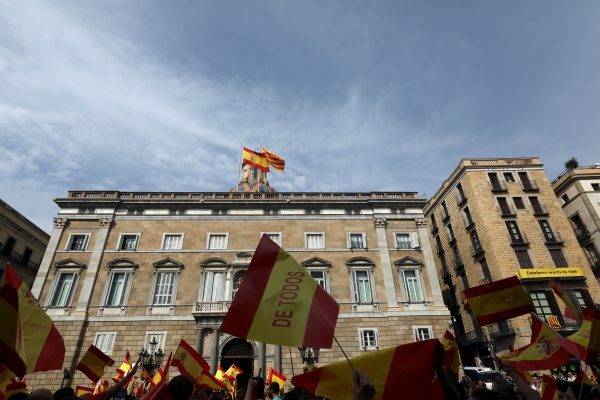 BARCELONA—Spanish police sealed off schools earmarked as polling stations and occupied the Catalan government’s communications hub on Saturday in efforts to prevent a banned independence referendum. Supporters of the poll spent the night in schools with their children and say they plan to remain there until Sunday to keep them open for voters, although a Spanish government source said more than half had been closed off. Tens of thousands of Catalans are expected to attempt to vote in a ballot that will have no legal status as it has been blocked by Spain’s Constitutional Court and Madrid for being at odds with the 1978 constitution. Catalonia is a wealthy region within Spain with its own language, which is taught in schools and universally spoken. “We slept and waited for them (police) so that they would not try to evict us or tell us what they wanted,” Giselle, who did not give her surname, said at a central Barcelona school where adults and children slept in sleeping bags on gym mats. “They came once and they were very polite. We told them we were inside and in peace,” Giselle added. A Spanish government source said police, who have been mobilized in their thousands to the region in the northeast of Spain to enforce a court order banning the referendum, would remove people from polling stations on Sunday. The Catalan government said police had occupied its communications hub and would remain there for two days after Catalonia’s High Court ordered police to prevent electronic voting and instructed Google to delete an application it said was being used to spread information on the vote. Despite central government and court efforts to prevent the referendum, Catalan leader Carles Puigdemont told Reuters on Friday it would go ahead, with no last minute compromise. “Everything is prepared at the more than 2,000 voting points so they have ballot boxes and voting slips, and have everything people need to express their opinion,” Puigdemont said. On Saturday the government source said police had sealed off 1,300 of the 2,315 schools in the region which were designated to be used for polling and 163 had been occupied by families. At a closing rally for the independence campaign in Barcelona on Friday, people formed the slogan “Referendum is democracy” in large white letters on a stage in front of a cheering crowd, many draped in the red-and-yellow Catalan flag. 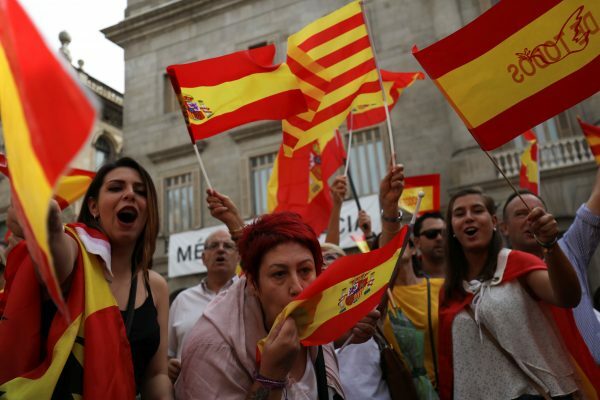 But in a sign of how the break-away attempt is opposed elsewhere in Spain, rallies took place outside town halls in major cities including Cordoba, Malaga and Zaragoza. 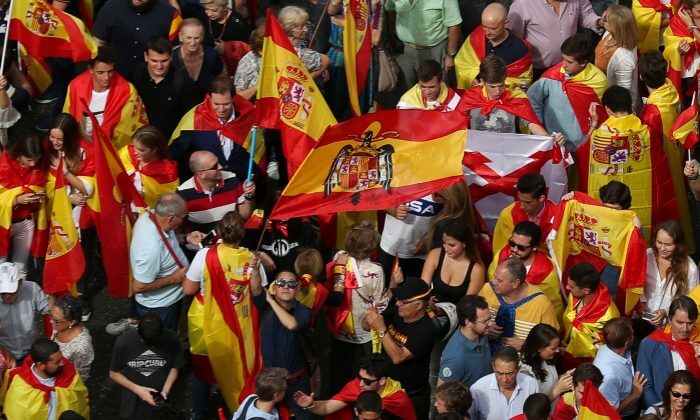 Hundreds gathered in the center of the capital Madrid waving Spanish flags and chanting ‘Spanish unity’ and ‘Don’t fool us – Catalonia is Spain’. Many balconies in the capital are draped with the red and yellow Spanish flag. In Catalonia, referendum organizers asked voters to turn up at 7 a.m. (0500 GMT) ahead of the polls opening at 9 a.m. Schools are traditionally where voting take place in Spain. “We must organize it so that there are long queues to give the image to the world that we are going to vote,” instructions sent to voters by its organizers said. “Act in a peaceful way and do no respond to any provocation, from other citizens or from police,” the instructions read. While all sides have called for people to remain peaceful, three people sustained minor injuries when they were shot at with a pellet gun outside a school late on Friday, police said. By Sam Edwards. Additional reporting by Alba Asenjo, Miguel Gutierrez and Sonya Dowsett.